You’ve pulled the trigger and have embarked on your fitness journey! Whether you’ve taken a class or hit the weights, your body is likely hurting in places you never knew you had muscles. Welcome to DOMS! Delayed Onset Muscle Soreness. While not always unavoidable, there are some things you can do to help relieve the pain. DOMS usually sets in anywhere from 12 to 24 hours, and typically lasts 2 to 3 days. There can be slight swelling (inflammation), tenderness to the touch, reduced strength, reduced range of motion, and discomfort when moving around - especially after sitting for a period of time. Here are some tips to reduce the effects, although you can’t really eliminate them altogether…. Stretching! So simple, yet most people don’t take the time to do it. I like to begin with some active, or dynamic, stretching to warm up my muscles. Big arm circles, leg swings, high knee skips, inchworm walks, etc. Then after I’m warm I begin my static stretches. Whatever body part I’m about to target with my workout is the muscle group I will spend the majority of my time on. I recommend stretching before and after a workout. Foam rolling and stretching go hand in hand. I’m a big believer in foam rollers and lacrosse balls for helping with tight muscles. Roll each muscle group for about 5 minutes, starting at calves and making your way up. Shift your weight around as you roll, and roll slowly. For places extra tight apply stagnant pressure for 10-20 seconds mid roll. Rolling everyday, not just post workout, can increase your range of motion! Heat is your friend! As well as ice! Save your heat for between workouts, or maybe in the evenings. If you have access to a jacuzzi use it. If not, a bathtub with epsom salts works great! You don’t want to do this immediately post workout tho, that can actually exacerbate inflammation and cause more pain. Immediate application of ice is said to help reduce inflammation. An ice bath will constrict blood vessels, flush toxins (lactic acid), and reduce tissue breakdown. 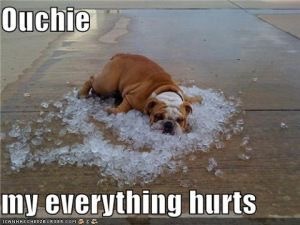 If you don’t have access to an ice bath, because really who does, you can massage cups of ice onto the muscle groups you just trained. I’ve frozen dixie cups of water and used that, it works just fine. Protein shakes! Within an hour or so of your workout grab a protein shake with BCAA’s and enjoy! Your begins to repair muscle tissue within an hour or so of your workout, and also while you sleep ~ this is protein synthesis. I do a shake post workout, and also right before bed. Another easy way to combat DOMS is to make sure you are getting enough Omega-3’s. This would be either to take a vitamin supplement (this is what I do), or eat enough foods rich in these “good fats”. This would be salmon, flax, avocado, and walnuts, to name a few. And finally the one you won’t want to hear…... keep moving your body! Try not to stay stagnant for too long, get up and walk around during the day. Take restorative yoga classes on your active rest days, go for walks or easy hikes, bike rides, just stay active!